Since 1999, The Mighty Electricians have provided electrical troubleshooting consultations for Valley homeowners. Our licensed electricians inspect and assess potential electric fire risks in your home. Leading causes of electrical fires include faulty circuit breakers, broken or deteriorating wiring, and bad switches or outlets. If any of these issues are found, it is not recommended to attempt to fix these on your own. Electricity is very dangerous both to your health and your home if mishandled. Every home — new or old — has the potential for electrical issues. Let us help you get ahead of these issues to correct them and protect your home from an electrical fire risk before it's too late. Our electrical inspections start with checking your residential electric panels, switches, and outlets. Further evaluation of wiring inside your walls may be required if rotten or broken wiring is suspected. Older homes sometimes still feature antiquated knob and tube wiring, which is a big fire hazard, so our experts can assess and recommend the most appropriate fix for your need. Most of the time, electrical troubleshooting reveals a simple, affordable fix, and we promise to be transparent with every immediate need and recommended upgrades for your home. 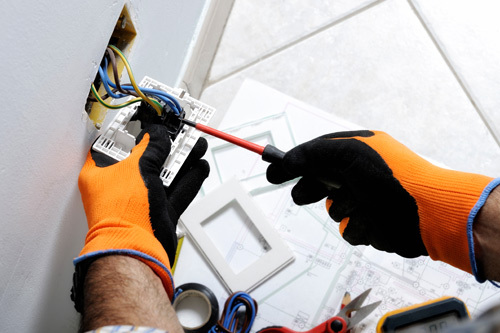 Our experts are quick to find electrical problems and can handle the necessary repairs with your approval. If you aren't ready to approve work immediately, our technicians will suggest repair recommendations and provide a comprehensive quote for your consideration. You will find our professionals to be trustworthy and courteous. Don't delay — schedule your electrical troubleshooting consultation with The Mighty Electricians in Phoenix, AZ today!